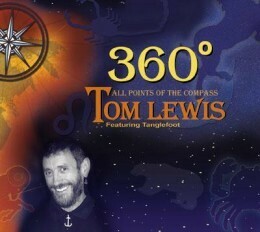 There are 16 points on a compass (according to Tom, though some may disagree) so that's approximately how many songs are on this CD. Titles and liner notes are listed below. "If there is a folk equivalent to Bye, Bye, Miss American Pie, it is Radio Times, by Tom Lewis. Time travel. World travel." Radio Times These are my memories and influences - if they invoke yours, so much the better. Port of Call A great song-writer and performer, Kieran Halpin is very active on stages all around the world. He's a "must see", if you get the opportunity. Nassau Bound I learned a lot about singing harmonies from The Beach Boys. This is the 'traditional' version of one of their biggest hits. St. Patrick's Song In all of my childhood, in Ireland, I saw no St. Patrick's Day fervour other than quite small religious celebrations. These days the "Patron Saint's" day is hugely celebrated in Ireland — largely for the benefit of tourists. Christmas at Sea He's remembered for writings such as: "Kidnapped"; "Treasure Island"; "Dr. Jekyll and Mr. Hyde"; etc., but R.L. Stevenson had a special affinity to the poetry of the sea. Towrope Girls From: SEA SONGS AND BALLADS 1917 - 1922; and set to this traditional melody (Quare Bungle Rye) by William Pint, of Seattle. The writings of Cicely Fox Smith were never less than concise, accurate and supremely evocative. Dutchman's Trousers As the younger child of a "single parent family" (before the term was in common usage) I spent many happy days in the company of my maternal Grandmother. Though I became aware of this evocative phrase from her, my metrological education never proceeded further. The Land One of my passports says I'm Canadian. I was born in Ireland - but spent my grammar-school years in England. Much of my 24-year naval career (and folk music apprenticeship) was spent in Scotland. Culturally I'm British—and there is, in my opinion, no finer example of British heritage than this piece. I never fail to find it, literally, hair-raising! The Nipper Ian Geddes: a Scot, transplanted to Massachusetts, and a fine singer in his own right; spotted an obvious problem with traditional shanties used in their original context, but concluded that we, of the current generation, have solved it! Blow the Man Down The archetypal (halliard) shanty, commonly used in Liverpool registered ships. Those old sailors would have been incredulous to hear female voices in their chorus. According to the Act The inauguration, by the British Parliament, of the Merchant Shipping Acts; mandating the conditions of employment of sailors; led to the Mercantile Marine being greatly envied by sailors of the Royal Navy, who continued to endure "hard usage" well into the 20th Century. The Bos'n, the Gunner and Me I found this song in Gosport Public Library whilst; on the orders of my supervising officer; making myself scarce - knowing full well that no-one would even think of looking for a sailor in a library! The librettist must have had aspirations about a career in opera—he changed his name from plain: "Henry Trotter"! If I Had a Boat It would seem that even famous and successful country music stars have a yearning for the ocean. I've had the temerity to replace Lyle's ultimate verse, which has always mystified me, with one of my own construction; about another one-time star of the small screen. Should Lyle ever hear this, I hope he'll forgive me. One Big Ocean This song came, directly, from a query by a 4th Grade student; wise beyond her years. She was well aware that I didn't know the answer to her perceptive question. Down by the Dockyard Wall What a pity Dame Vera Lynn never had an opportunity to record this. I'm sure that my old friend: "Shep" Woolley; would now be quite rich from the royalties of "her last hit". Goodbye From my earliest memories, the singing of Joseph Locke was part of the staple diet in our Belfast home. Check out the 1991 video: 'Hear My Song'. Wonderful. A Few Good Men (Hidden Track). A Few Good Men are, so the advertising billboards inform us, all that the United States Marine Corps requires, in order to perform its sterling duty. Semper Fi, guys.